The legislative session continued past the voter-approved 90-day session, as an annual reminder that statute is easy for the Legislature to ignore. Legislators are now barrelling to the 121-day constitutional deadline, which carries real financial consequences for legislators thanks to last year’s House Bill 44. That bill would bar legislators from collecting per diem if a fully funded operating budget hasn’t been passed by then. Anyways, here’s what’s been going on. The Legislature’s annual all-day confirmation session is scheduled for Wednesday and it’s going to be a real doozy. We can’t recall a time where there’s been more controversy surrounding the slate put forward by the governor than this one, particularly when it comes to the big-ticket appointments like the commissioner positions. Of course, many of the most controversial positions—like resume-fabricating John Quick, QAnon Twitter troll Tammy Randolph and resigned-before-he-was-recalled Trevor Shaw—have all already pulled their names from consideration. Those candidates had obvious disqualifying flaws, leaving the remaining field in more of a gray area—or perhaps a more paranormal area. The big fight brewing is around Department of Public Safety Commissioner-designee Amanda Price. The salacious has dominated the talk around her appointment lately, with former Chief of Staff Scott Kendall giving an on-the-record voice to long-standing rumors about Price’s time in the Walker administration. At last week’s hearing, he voiced concerns about Price’s absenteeism and said he was aware of accusations that she had plagiarized work while on the job. Price has denied both claims, and the matter was further muddied with supportive testimony from other former Walker Chief of Staff Jim Whitaker and Marcia Davis, a deputy chief of staff for Walker. 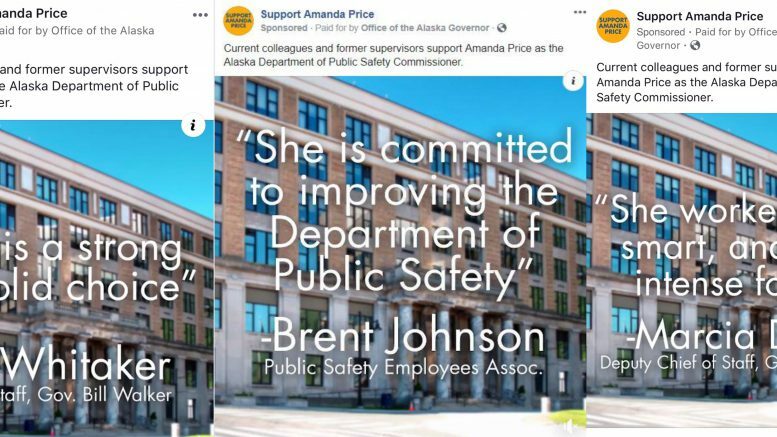 The governor’s office has taken the unusual step of buying Facebook ads running with quotes from Whitaker, Davis and Brent Johnson, Public Safety Employee Association President Brent Johnson. It’s the first time that we can recall seeing anything quite like this. It’s not the first time this administration has resorted to advertising to help push along its agenda. The administration was caught spending some $9,000 to drum up opposition to the House budget town halls in Kenai, Wasilla and Fairbanks. While much of the last-minute focus has been on her job performance under the Walker administration, there are certainly legislators who have concerns about Price’s performance in her current job. The Special Committee on Tribal Affairs has grilled Price about her seemingly dismissive attitudes toward Village Public Safety Officers, which hasn’t been helped by Price’s frequent statements that she supports improving “rural safety” with a hint that that might not focus on the VPSO program. There have also seemed to be some concerns about Price’s lack of law enforcement experience as she takes the helm of the Department of Public Safety. Price said at one hearing that perhaps her lack of law enforcement experience is a good thing and that officers don’t always make the best managers. At the House Majority’s Friday press conference, legislators generally punted on questions about the appointees, saying they hadn’t seen the hearing with Price’s supervisors, but Rep. Tammie Wilson, R-North Pole, jumped right in. Price will be back up in front of the House State Affairs Committee at 3 p.m. The House voted 37-1 to extend a freeze on the state’s program to pay a portion of local school construction bond debt payments. The moratorium was set to expire in 2020 but would be extended to 2025 under the legislation. The school bond debt payments have already been an issue this session as the administration and the Legislature have moved to either eliminate or reduce the funding for the bond debt payments that are already in the system. The major concern about cutting this funding is that municipalities and their voters approved the bond payments with the expectation that the state would be covering a portion—ranging from 90 to 70 percent depending on when the bonds were approved. It’s expected that municipalities will have no choice but to raise property taxes to cover the lost funding. The House voted on the floor to restore 50 percent of the funding in its operating budget. When the moratorium expires in 2025, the state would reduce its reimbursement rate to 50 percent. The legislation now heads to the Senate. Rep. Sharon Jackson, R-Eagle River, voted against the measure. With a lot of talk swirling around the cost of education in Alaska, the House Education Committee held a hearing on Monday morning with the title “Why is education so costly in Alaska” by everyone’s favorite university-based research agency, UAA’s Institute of Social and Economic Research. The takeaway from education policy researcher Dr. Dayna DeFeo, essentially, that many of the cost drivers in Alaska’s education system rest outside of the control of the classroom, schools and the education system in general. There are high heating costs, high energy costs and high health care costs. It came as a surprise to some on the committee that the Power Cost Equalization program doesn’t extend to the energy costs of the school districts. The presentation touched on the cost of teacher turnover, noting that it also drives costs for the districts and undermines the quality of education when you can’t retain teachers into their more effective years (about year five and on). DeFeo said ultimately that districts are quite limited in where they can absorb budget cuts. Rep. Jonathan Kreiss-Tomkins, D-Sitka, introduced House Joint Resolution 15 on Monday. The proposed constitutional amendment would do away with the higher bar for the Legislature to override a governor’s budget veto. Instead of requiring a three-quarter vote (or 45 votes) to override a veto, it would set the standard override of two-thirds (40 total votes) for all legislation. It was referred to the House State Affairs, Judiciary and Finance committees. After a particularly bitter wrap up to the operating budget, the House rallied together to beat the Senate in a weekend softball game 14-10. It was the subject of floor speeches on Monday, with a particularly good retelling by Rep. Laddie Shaw, who also just so happened to literally parachute into the game. Be the first to comment on "AKLEG Day 91: Ahead of confirmation vote, Dunleavy administration launches ads in support of Price"